When it comes to Seattle-area island weddings, the San Juans tend to come immediately to mind, but wedding vendors and event specialists on the nearby island of Whidbey want you to know about their fairly spectacular water-surrounded isle. Whidbey Island Winery. Image via Whidbey Weddings and Events Tour. On Saturday, November 9 from 11:30 to 5, you're invited to meet up at Crockett Barn in Coupeville (fun fact: second oldest city in the state) and proceed from there with the Weddings on Whidbey and Events Tour gang to check out a total of five venues and meet more than forty on-island event specialists including caterers, winery professionals, bakers, designers, and more. Island life across the narrow waterway from Edmonds feels at once rustic, romantic, historical, and luxe, and pretty darn accessible. Just 25 miles north of Seattle, Whidbey's official tagline is "the closest distance to far away." Cute, right? 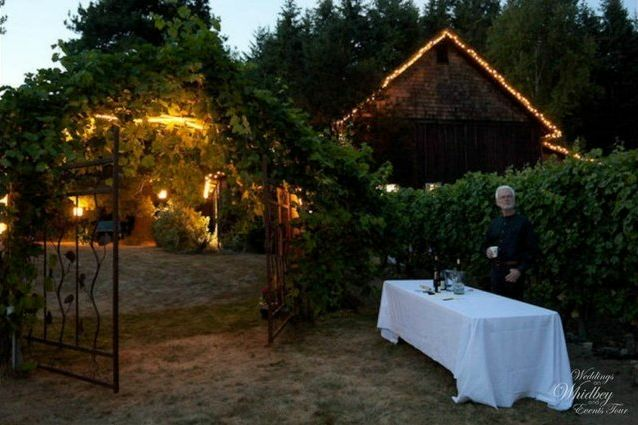 Weddings on Whidbey and Events Tour organizers have made it easy for you to get from here to there; check out their Facebook page for inspiration, go over important logistics details on their website, and then head to Eventbrite for tickets, which start at $20.